Find out built up area in Sqft.of per flat per House/Dwelling unit. Apply the diversity factor and Compute the load of all dwelling units in the area. Add the load of common services such as Auditorium, Street Lights, Lifts and Water Pumps etc. For simplicity purpose 0.5kW/dwelling units may be considered as common load. Compute the “Total Load” of the area by adding load observed at above. Apply the power factor of 0.8 to determine the load in kVA. Take transformer loading of 65% considering the network arrangement Ring Main Circuit. If load is equal to or more than 2.50MVA, the area shall be fed through 33kV feeder. For such loads, the land space for 33/11kV Sub-station shall have to be allocated by builder / Society/ Authority. For load between 1 MVA to 2.5MVA, dedicated 11kV feeder shall be preferred. For load below 1 MVA, existing 11kV feed can be tapped through VCB or RMU. Select T.C Size of 25 KVA,63 KVA,100 KVA,200 KVA or 400 KVA according to your Load. The maximum capacity of distribution transformer acceptable is 400 kVA as a standard capacity. Only two-no of transformer at one location shall be acceptable. If there is more number of transformers HT shall be required to extend using underground cables to locate additional transformer. Either VCB or Ring Main Circuit shall be used to control transformers. There cables should have metering arrangement at 11kV. The protection system at incoming supply shall be using numerical relays. On LT side of transformer, LT main feeder pillar shall be provided. The Incoming shall be protected by MCCB/SFU. The distribution pillar-box shall be connected into Ring Main Unit. The incomer of distribution pillar shall have MCCB / SFU. The outgoing shall have HRC fuses. Decide Size of LT Cable from T.C to LT Panel as per following Table. The factors for cable loading shall be taken as 70%. The factor for multiplicity of cables from same cable trench shall be 80%. The suggested maximum length of LT cable feeder shall be 250 Mtrs. The LT cables shall be connected in ring main circuit. The load on sub-feeder pillar shall be restricted to 150kW. The entire system has to be designed for a voltage drop of 2.0% from11kV Side of transformer to metering equipment at end consumer premises. The entire system has to be designed for T&D losses of service maximum 2.0% from 11kV to end consumer meter including of service cable. The word “demand” itself says the meaning of Demand Factor. The ratio of the maximum coincident demand of a system, or part of a system, to the total connected load of the system. For example, an over sized motor 20 Kw drives a constant 15 Kw load whenever it is ON. The motor demand factor is then 15/20 =0.75= 75 %. Demand Factor is express as a percentage (%) or in a ratio (less than 1). Demand factor is always < =1. Demand Factor is always change with the time to time or hours to hours of use and it will not constant. The connected load is always known so it will be easy to calculate the maximum demand if the demand factor for a certain supply is known at different time intervals and seasons. The lower the demand factor, the less system capacity required to serve the connected load. (1) A Residence Consumer has 10 No’s Lamp of 400 W but at the same time It is possible that only 9 No’s of Bulbs are used at the same time. Here Total Connected load is 10×40=400 W. Consumer maximum demand is 9×40=360 W. Demand Facto of this Load = 360/400 =0.9 or 90%. For this Consumer it is observed that only half of the lights being turned ON at a time so we can say that the demand factor is 0.5 (50%). The estimated load = 600 Kw X 0.5 = 300 Kw. Feeder conductors should have sufficient Ampere Capacity to carry the load. The Ampere Capacity does not always be equal to the total of all loads on connected branch-circuits. This factor must be applied to each individual load, with particular attention to electric motors, which are very rarely operated at full load. As per National Electrical Code (NEC) demand factor may be applied to the total load. The demand factor permits a feeder ampearcity to be less than 100 percent of all the branch-circuit loads connected to it. Demand factor can be applied to calculate the size of the sub-main which is feeding a Sub panel or a fixed load like a motor etc. If the panel have total load of 250 kVA , considering a Demand factor of 0.8, we can size the feeder cable for 250 x 0.8= 200 kVA. Demand factors for buildings typically range between 50 and 80 % of the connected load. In an industrial installation this factor may be estimated on an average at 0.75 for motors. For incandescent-lighting loads, the factor always equals 1. Diversity Factor is ratio of the sum of the individual maximum demands of the various sub circuit of a system to the maximum demand of the whole system. Diversity Factor = Sum of Individual Maximum Demands / Maximum Demand of the System. Diversity Factor = Installed load / Running load. The diversity factor is always >= 1. Diversity Factor is always >1 because sum of individual max. Demands >Max. Demand. In other terms, Diversity Factor (0 to 100%) is a fraction of Total Load that is particular item contributed to peak demand. 70% diversity means that the device operates at its nominal or maximum load level 70% of the time that it is connected and turned ON. It is expressed as a percentage (%) or a ratio more than 1. If we use diversity value in % than it should be multiply with Load and if we use in numerical value (>1) than it should be divided with Load. Diversity occurs in an operating system because all loads connected to the System are not operating simultaneously or are not simultaneously operating at their maximum rating. The diversity factor shows that the whole electrical load does not equal the sum of its parts due to this time Interdependence (i.e. diverseness). In general terms we can say that diversity factor refers to the percent of time available that a machine. 70% diversity means that the device operates at its nominal or maximum load level 70% of the time that it is connected and turned ON. Consider two Feeders with the same maximum demand but that occur at different intervals of time. When supplied by the same feeder, the demand on such is less the sum of the two demands. In electrical design, this condition is known as diversity. Diversity factor is an extended version of demand factor. It deals with maximum demand of different units at a time/Maximum demand of the entire system. Greater the diversity factor, lesser is the cost of generation of power. Many designers prefer to use unity as the diversity factor in calculations for planning conservatism because of plant load growth uncertainties. Local experience can justify using a diversity factor larger than unity, and smaller service entrance conductors and transformer requirements chosen accordingly. The diversity factor for all other installations will be different, and would be based upon a local evaluation of the loads to be applied at different moments in time. Assuming it to be 1.0 may, on some occasions, result in a supply feeder and equipment rating that is rather larger than the local installation warrants, and an over-investment in cable and equipment to handle the rated load current. It is better to evaluate the pattern of usage of the loads and calculate an acceptable diversity factor for each particular case. One Main Feeder have two Sub feeder (Sub Feeder A and Sub Feeder B), Sub Feeder-A have demand at a time is 35 KW and Sub Feeder-B have demands at a time is 42 KW, but the maximum demand of Main Feeder is 70 KW. Total individual Maximum Demand =35+42=77 KW. Diversity factor can shoot up above 1. Diversity factor is commonly used for a complete a coordination study for a system. This diversity factor is used to estimate the load of a particular node in the system. Diversity factors have been developed for main feeders supplying a number of feeders, and typically 1.2 to 1.3 for Residence Consumer and 1.1 to 1.2 for Commercial Load. 1.50 to 2.00 for power and lighting loads. Note: Reciprocal of the above ratio (will be more than 1) also is used in some other countries. Diversity factor is mostly used for distribution feeder size and transformer as well as to determine the maximum peak load and diversity factor is always based on knowing the process. You have to understand what will be on or off at a given time for different buildings and this will size the feeder. Note for typical buildings diversity factor is always one. You have to estimate or have a data records to create 24 hours load graph and you can determine the maximum demand load for node then you can easily determine the feeder and transformer size. 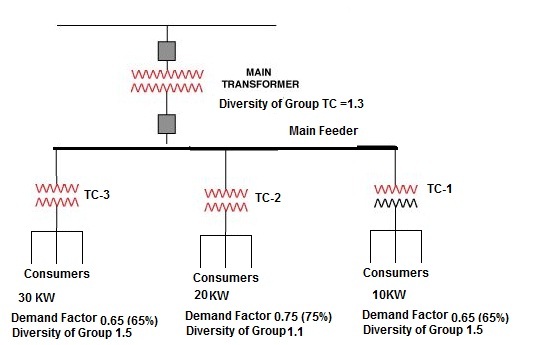 The diversity factor of a feeder would be the sum of the maximum demands of the individual consumers divided by the maximum demand of the feeder. In the same manner, it is possible to compute the diversity factor on a substation, a transmission line or a whole utility system. The residential load has the highest diversity factor. Industrial loads have low diversity factors usually of 1.4, street light practically unity and other loads vary between these limits. The ratio of the Actual Load of equipment to Full load of equipment. It is the ratio of actual kilowatt-Hours used in a given period, divided by the total possible kilowatt -hours that could have been used in the same period at the peak KW level. In other terms Load factor is defined as the ratio of Average load to maximum demand during a given period. The Load factor is always <=1. Load Factor is always less than 1 because maximum demand is always more than average demand. Load Factor can be calculated for a single day, for a month or for a year. Load factor in other terms of efficiency. It is used for determining the overall cost per unit generated. Higher the load factor is GOOD and it will more Output of Plan, lesser the cost per unit which means an electricity generator can sell more electricity at a higher spark spread, Fixed costs are spread over more kWh of output. A power plant may be highly efficient at High load factors. Low load factor is a BED. A low load factor will use electricity inefficiently relative to what we could be if we were controlling our peak demand. A power plant may be less efficient at low load factors. For almost constant loads, the load factor is close to unity. For Varying Load Factor is closed Zero. Load Factor is a measure of the effective utilization of the load and distribution equipment, i.e. higher load factor means better utilization of the transformer, line or cable. A high load factor means power usage is relatively constant. Low load factor shows that occasionally a high demand is set. To service that peak, capacity is sitting idle for long periods, thereby imposing higher costs on the system. Electrical rates are designed so that customers with high load factor are charged less overall per kWh. Sometimes utility companies will encourage industrial customers to improve their load factors. Load factor is term that does not appear on your utility bill, but does affect electricity costs. Load factor indicates how efficiently the customer is using peak demand. Motor of 20 hp drives a constant 15 hp load whenever it is on. The motor load factor is then 15/20 = 75%. Expressed as a percentage (%) or a ratio less than 1. The Confidence Factor is always <=1. Usually Confidence Factor will decrease as the number of connected customer’s increases. The factor ks is applied to each group of loads (e.g. distribution or sub-distribution board). The determination of these factors is the responsibility of the designer, since it requires a detailed knowledge of the installation and the conditions in which the individual circuits are to be exploited. For this reason, it is not possible to give precise values for general application. The maximum demand of an installation is the maximum rate of consumption expressed in amperes, kW or kVA. It is generally taken as the average rate of consumption over a period of time. Example the 15-minute maximum kW demand for the week was 150 kW. Maximum demand does not include motor starting currents or other transient effects. Fault currents and overload currents are also excluded. Maximum demand in KW is relevant only for metering/tariff purposes. Maximum demand (often referred to as MD) is the largest current normally carried by circuits, switches and protective devices. It does not include the levels of current flowing under overload or short circuit conditions. The major disadvantage of allocating load using the diversity factors is that most utilities will not have a table of diversity factors and sometime it is not viable to determine accurate Diversity Factor. In this situation Maximum Demand is very helpful to calculate size of Feeder or TC. The kVA rating of all distribution transformers is always known for a feeder. The metered readings can be taken to each transformer based upon the transformer rating. An “allocation factor” (AF) can be calculate. Allocation Factor= Metered Demand (KVA) / Total KVA. Actual Loading or Size of TC-1 and TC-2. Total Load on TC-1 =10+11+12+08= 41 KW. 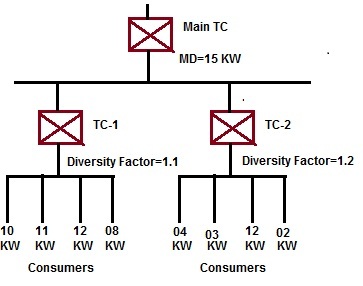 Maximum Diversity Demand of TC-1= 41 / 1.1 = 37.3 KW. Total Load on TC-2 =4+3+12+02= 21 KW. Maximum Diversity Demand of TC-2= 21 / 1.2 = 17.5 KW. Total Load= 37.3 + 17.5 =54.8 KW. Actual Load on TC-1=0.27×37.3 = 1.20 KW. Actual Load on TC-2=0.27×17.5 = 4.8 KW. Assessment of maximum demand is very easy for Resistive Load , For example, the maximum demand of a 240 V single-phase 8 kW shower heater can be calculated by dividing the power (8 kW) by the voltage (240 V) to give a current of 33.3 A. This calculation assumes a power factor of unity, which is a reasonable assumption for such a purely resistive load. Lighting circuits pose a special problem when determining MD. Discharge lamps are particularly difficult to assess, and current cannot be calculated simply by dividing lamp power by supply voltage. The reasons for this are Control gear losses result in additional current, the power factor is usually less than unity so current is greater, and Chokes and other control gear usually distort the waveform of the current so that it contains harmonics which are additional to the fundamental supply current. Switches for circuits feeding discharge lamps must be rated at twice the current they are required to carry, unless they have been specially constructed to withstand the severe arcing resulting from the switching of such inductive and capacitive loads. There is generally confusion between Demand factor and Diversity factor. Demand factors should be ideally applied to individual loads and diversity factor to a group of loads. When you talk about ‘diversity’, there are naturally more than one or many loads involved. Demand factor can be applied to calculate the size of the sub-main, which is feeding a Sub panel or a fixed load like a motor etc, individual Load. Demand factors are more conservative and are used by NEC for service and feeder sizing. If the Sub panel have total load is 250 kVA , considering a Demand factor of 0.8, we can size the feeder cable for 250 x 0.8= 200 kVA. The Diversity Factor is applied to each group of loads (e.g. being supplied from a distribution or sub-distribution board), size the Transformer. Demand factors and diversity factors are used in design. For example, the sum of the connected loads supplied by a feeder is multiplied by the demand factor to determine the load for which the feeder must be sized. This load is termed the maximum demand of the feeder. The sum of the maximum demand loads for a number of sub feeders divided by the diversity factor for the sub feeders will give the maximum demand load to be supplied by the feeder from which the sub feeders are derived. The estimated electrical demand for all feeders served directly from the service entrance is calculated by multiplying the total connected loads by their demand factors and then adding all of these together. This sum is divided by the diversity factor (frequently assumed to be unity) to calculate the service entrance demand which is used to determine ampacity requirements for the service entrance conductors. When used Diversity and Demand Factor in an electrical design it should be applied as follows, the sum of the connected loads supplied by a feeder-circuit can be multiplied by the demand factor to determine the load used to size the components of the system. The sum of the maximum demand loads for two or more feeders is divided by the diversity factor for the feeders to derive the maximum demand load. Feeder Breaker-1 Demand Load= Feeder Breaker-1xDemand Factor. Feeder Breaker-2 Demand Load= Feeder Breaker-2xDemand Factor. Feeder Breaker-3 Demand Load= Feeder Breaker-3xDemand Factor. 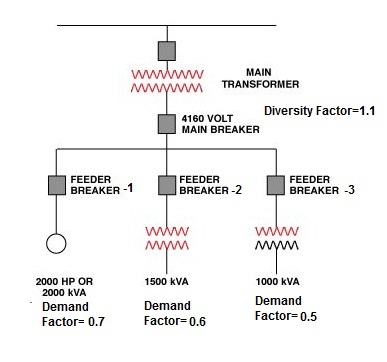 Transformer Demand Load= Total Feeder Breaker Demand / Diversity Factor. If we Calculated Total Load on Transformer without any Demand & Diversity=2000+1500+1000=4500KVA. Maximum Demand on TC-1 =6.5 KW/1.5 = 4 KW. Maximum Demand on TC-3 =19.5 KW/1.5 = 13 KW. Individual Maximum Demand on Main Transformer =04+14+13= 31 KW. Load factor and diversity factor play an important part in the cost of the supply of electrical energy. Higher the values of load factor and diversity factors, lower will be the overall cost per unit generated. The capital cost of the power station depends upon the capacity of the power station. Lower the maximum demand of the power station, the lower is the capacity required and therefore lower is the capital cost of the plant. With a given number of consumers the higher the diversity factor of their loads, the smaller will be the capacity of the plant required and consequently the fixed charges due to capital investment will be much reduced. Similarly higher load factor means more average load or more number of units generated for a given maximum demand and therefore overall cost per unit of electrical energy generated is reduced due to distribution of standing charges which are proportional to maximum demand and independent of number of units generated. Thus the suppliers should always try to improve the load factor as well as diversity factor by inducing the consumers to use the electrical energy during off peak hours and they may be charged at lower rates for such schemes. Calculate Transverse Load on PCC/RCC/Tublar/RSJ Pole. Calculate Transverse Load on PCC/RCC/RSJ/Tublar/RSJ Pole. Calculate Wind Load on Pole. Calculate wind Load on all Conductors. Decide spacing between Two Conductor as per IS:5613. Calculate required Voltage level of Overhead Line according to Distance. An Earth Leakage Circuit Breaker (ELCB) is a device used to directly detect currents leaking to earth from an installation and cut the power and mainly used in TT earthing systems. Current Earth Leakage Current Earth Leakage Circuit Breaker (Current-ELCB). Voltage-ELCB is a voltage operated circuit breaker. The device will function when the Current passes through the ELCB. Voltage-ELCB contains relay Coil which it being connected to the metallic load body at one end and it is connected to ground wire at the other end. If the voltage of the Equipment body is rise (by touching Phase to metal Part or Failure of Insulation of Equipment) which could cause the difference between earth and load body voltage, the danger of electric shock will occur. This voltage difference will produce an electric current from the load metallic body passes the relay loop and to earth. When voltage on the equipment metallic body rose to the danger level which exceed to 50Volt, the flowing current through relay loop could move the relay contact by disconnecting the supply current to avoid from any danger electric shock. The ELCB detects fault currents from live to the earth (ground) wire within the installation it protects. If sufficient voltage appears across the ELCB’s sense coil, it will switch off the power, and remain off until manually reset. A voltage-sensing ELCB does not sense fault currents from live to any other earthed body. These ELCBs monitored the voltage on the earth wire, and disconnected the supply if the earth wire voltage was over 50 volts. These devices are no longer used due to its drawbacks like if the fault is between live and a circuit earth, they will disconnect the supply. However, if the fault is between live and some other earth (such as a person or a metal water pipe), they will NOT disconnect, as the voltage on the circuit earth will not change. Even if the fault is between live and a circuit earth, parallel earth paths created via gas or water pipes can result in the ELCB being bypassed. Most of the fault current will flow via the gas or water pipes, since a single earth stake will inevitably have a much higher impedance than hundreds of meters of metal service pipes buried in the ground. The way to identify an ELCB is by looking for green or green and yellow earth wires entering the device. They rely on voltage returning to the trip via the earth wire during a fault and afford only limited protection to the installation and no personal protection at all. You should use plug in 30mA RCD’s for any appliances and extension leads that may be used outside as a minimum. ELCBs have one advantage over RCDs: they are less sensitive to fault conditions, and therefore have fewer nuisance trips. While voltage and current on the earth line is usually fault current from a live wire, this is not always the case, thus there are situations in which an ELCB can nuisance trip. When an installation has two connections to earth, a nearby high current lightning strike will cause a voltage gradient in the soil, presenting the ELCB sense coil with enough voltage to cause it to trip. If the installation’s earth rod is placed close to the earth rod of a neighboring building, a high earth leakage current in the other building can raise the local ground potential and cause a voltage difference across the two earths, again tripping the ELCB. If there is an accumulated or burden of currents caused by items with lowered insulation resistance due to older equipment, or with heating elements, or rain conditions can cause the insulation resistance to lower due to moisture tracking. If there is a some mA which is equal to ELCB rating than ELCB may give nuisance Tripping. If either of the earth wires become disconnected from the ELCB, it will no longer trip or the installation will often no longer be properly earthed. Some ELCBs do not respond to rectified fault current. This issue is common for ELCBs and RCDs, but ELCBs are on average much older than RCB so an old ELCB is more likely to have some uncommon fault current waveform that it will not respond to. Voltage-operated ELCB are the requirement for a second connection, and the possibility that any additional connection to earth on the protected system can disable the detector. Nuisance tripping especially during thunderstorms. They do not detect faults that don’t pass current through the CPC to the earth rod. They do not allow a single building system to be easily split into multiple sections with independent fault protection, because earthing systems are usually use common earth Rod. They may be tripped by external voltages from something connected to the earthing system such as metal pipes, a TN-S earth or a TN-C-S combined neutral and earth. As electrically leaky appliances such as some water heaters, washing machines and cookers may cause the ELCB to trip. ELCBs introduce additional resistance and an additional point of failure into the earthing system. Can we assume whether Our Electrical System is protected against Earth Protection or not by only Pressing ELCB Test Switch? Checking the health of the ELCB is simple and you can do it easily by pressing TEST Push Button Switch of ELCB. The test push-button will test whether the ELCB unit is working properly or not. Can we assume that If ELCB is Trip after Pressing TEST Switch of ELCB than your system is protected against earth protection? Then you are wrong. The test facility provided on the home ELCB will only confirm the health of the ELCB unit, but that test does not confirm that the ELCB will trip when an electric shock hazard does occur. It is a really sad fact that all the while this misunderstanding has left many homes totally unprotected from the risk of electric shocks. This brings us or alarming us to think over second basic requirement for earth protection. The second requirement for the proper operation of a home shock protection system is electrical grounding. We can assume that the ELCB is the brain for the shock protection, and the grounding as the backbone. Therefore, without a functional grounding (Proper Earthing of Electrical System) there is totally no protection against electrical shocks in your house even if You have installed ELCB and its TEST switch show proper result. Looking after the ELCB alone is not enough. The electrical Earthing system must also be in good working order for the shock protection system to work. In addition to routine inspections that should be done by the qualified electrician, this grounding should preferably be inspected regularly at shorter intervals by the homeowner and need to pour Water in Earthing Pit at Regular interval of Time to minimize Earth Resistance. Current-operated ELCBs are generally known as Residual-current devices (RCD). These also protect against earth leakage. Both circuit conductors (supply and return) are run through a sensing coil; any imbalance of the currents means the magnetic field does not perfectly cancel. The device detects the imbalance and trips the contact. When the term ELCB is used it usually means a voltage-operated device. Similar devices that are current operated are called residual-current devices. However, some companies use the term ELCB to distinguish high sensitivity current operated 3 phase devices that trip in the milliamp range from traditional 3 phase ground fault devices that operate at much higher currents. The supply coil, the neutral coil and the search coil all wound on a common transformer core. On a healthy circuit the same current passes through the phase coil, the load and return back through the neutral coil. Both the phase and the neutral coils are wound in such a way that they will produce an opposing magnetic flux. With the same current passing through both coils, their magnetic effect will cancel out under a healthy circuit condition. In a situation when there is fault or a leakage to earth in the load circuit, or anywhere between the load circuit and the output connection of the RCB circuit, the current returning through the neutral coil has been reduced. Then the magnetic flux inside the transformer core is not balanced anymore. The total sum of the opposing magnetic flux is no longer zero. This net remaining flux is what we call a residual flux. The periodically changing residual flux inside the transformer core crosses path with the winding of the search coil. This action produces an electromotive force (e.m.f.) across the search coil. An electromotive force is actually an alternating voltage. The induced voltage across the search coil produces a current inside the wiring of the trip circuit. It is this current that operates the trip coil of the circuit breaker. Since the trip current is driven by the residual magnetic flux (the resulting flux, the net effect between both fluxes) between the phase and the neutral coils, it is called the residual current devise. With a circuit breaker incorporated as part of the circuit, the assembled system is called residual current circuit breaker (RCCB) or residual current devise (RCD). The incoming current has to pass through the circuit breaker first before going to the phase coil. The return neutral path passes through the second circuit breaker pole. 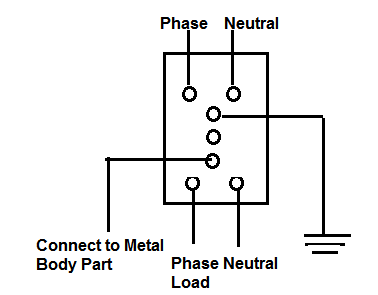 During tripping when a fault is detected, both the phase and neutral connection is isolated. RCD sensitivity is expressed as the rated residual operating current, noted IΔn. Preferred values have been defined by the IEC, thus making it possible to divide RCDs into three groups according to their IΔn value. Standard IEC 60755 (General requirements for residual current operated protective devices) defines three types of RCD depending on the characteristics of the fault current. For residual pulsating direct currents superimposed by a smooth direct current of 0.006 A, with or without phase-angle control, independent of the polarity.